Fastest way to number team uniforms. 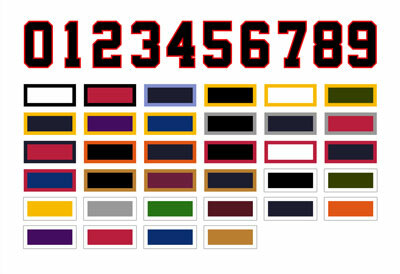 Goof Proof screen printed numbers are available in a wide variety of colors to coordinate with any team's home and away uniforms to create personalized football, basketball, baseball, and hockey jerseys, or any other sport uniforms. Request a Goof Proof Number sample. Easy to align with pre-printed grid pattern on the back. One-step application for 2-color numbers. Only 4 seconds to heat apply. Recommended fabrics: cotton, polyester and cotton/poly blends. Use Elasti Prints® Numbers for heat-sensitive fabrics. Sizes Available: 4", 6", 8", 10"
The Avalon style is made with Elasti-Prints for stretchable fabrics in polyester, cotton, & cotton/poly blends. Apply at 275 degrees for 15 seconds, peel cold. If you need 1, 2, 2.5” or 3” numbers, use Express Names to order, entering the digits you need instead of letters. When placing arched names over 8" numbers on the back of a split front baseball jersey what is the recommended placement for the names? The numbers? 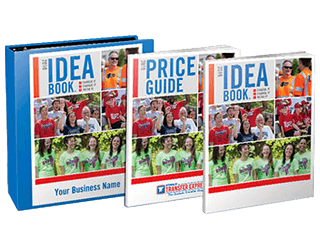 The same guidelines can be used when applying Express Names™ and our Easy Prints® Numbers use the same guidelines. 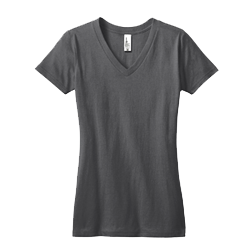 Place the name about 4 fingers down from the neck seam with the numbers touching the Express Names™ paper. If using the Peel n’ Press letters the number usually starts at the lowest point of the arched name. When ordering 2 color numbers: If I want purple numbers outlined in white, when I pick the color options, is it purple/white or white/purple? The second color listed is the outline color, so purple/white is purple with a white outline. Can I use numbers on nylon jerseys? 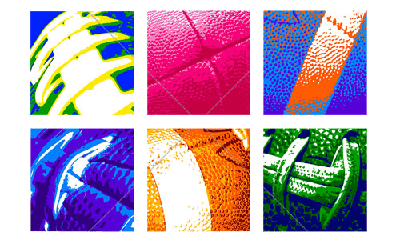 Our numbers are guaranteed to work when applied to cotton, polyester, or cotton/poly blends. They typically do not work on nylon.